Meet the LG Rebel LTE L44VL, a budget smartphone that brings to you some of the high-end specs, packed in a 4.5-inch gadget. It's an Android 5.1 Lollipop phone with a quad-core processor running at 1.1GHz. The Rebel LTE L44VL is a CDMA phone that will be activated on the Verizon network, so be sure to check that you have Verizon coverage/cell towers in your area before ordering. Now, the Rebel LTE L44VL is the CDMA/Verizon variant of the Rebel LTE L43AL which is a GSM/AT&T phone, also from LG Electronics. They are totally identical; the only difference is the network they are activated on. LG Rebel L44VL includes a bunch of great features that you can only experience when it is your palm. 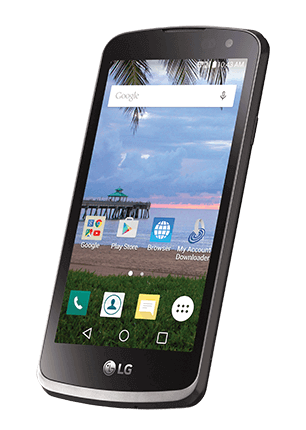 LG Rebel L44VL is a prepaid smartphone that you can order from Straight Talk or Tracfone Wireless websites. The purchase box includes the device, battery, power adapter, standard USB cable, activation card, service guide and setup manuals. On the Rebel L44VL design, LG Electronics opted to use the conventional design when it comes to the layout of buttons around the phone. On other Straight Talk LG phones that I have used, you would find buttons on the back cover and none on the edges. So let's look at the LG Rebel L44VL layout. Along the left edge, we have the volume rockers. The power button rests on the right edge. The upper edge only has the noise cancellation mic. On the lower edge, we have the micro-USB port, a headphone jack, and your microphone. The back cover has a flat layout, which is pretty typical and is removable to reveal the battery, SIM slot, and microSD slot. On the back lies the camera with a LED flash on the upper part, and your speaker on the lower side. Coming to the front we have the 4.5-inch display. The upper part of the screen holds the front camera, proximity sensor, as well as your earpiece. The LG Rebel L44VL has the floating navigation buttons at the lower part of the display, which is a norm for most Android 5.1 Lollipop phones. The buttons are embedded in the Operating System, so they appear and disappear depending on what you are doing on the screen. Here is the arrangement of the buttons; the back button is on the left, home button in the middle and the recent apps button on the right. This wraps up our design, so we are going to look at the features. Pictures are crucial, and LG knows that clearly. Despite the LG Rebel L44VL being a budget phone, it packs a 5MP back camera and a 2MP front camera with amazing features. You will capture brilliant photos that you will love. There's one feature that impressed on the Rebel L44VL Camera. That you can simultaneously take pictures as you shoot a video. Say you are attending a sports function and you are not sure whether you want to shoot a video or take photos - how about you take both at the same time and decide later? Amazing! I can say. Surprisingly, the photos don't turn out as blurred even when the subject is in motion. Another fantastic feature about the camera is that it supports voice command. When the voice command feature is activated, you can take a selfie by just saying "cheese," or "Smile," or "LG," etc. That's not all; you can also use gestures. When you activate the gesture shot feature, you can capture photos by simply raising your hand in a clenched fist. Then when you unclench the fist, the camera starts a timer, allowing you to move your hand and get in position. I found this to be amazing because I can set my phone, say on a raised surface and actually be a part of the picture! The camera includes other amazing features like multi-point autofocus allowing to see a clear image. Video capture is in high definition 720p. With Burst shot, you can take as many shots in a row until you release the capture button. You can also start the camera app by pressing either the volume up or volume down twice. Personally, I think this is a wonderful camera that you would love to have on a budget phone. The LG Rebel L44VL comes with a 4.5-inch TFT display with a resolution of 854 x 480 pixels which is brilliant and clear. The screen is very vibrant, and I noticed it's almost edge to edge, so you get a nice display of whatever you are doing on the screen; whether you are streaming videos or playing games. It has a very thin bezel snaking around the screen which doesn't eat much into the display - it makes the LG Rebel L44VL feel premium. Viewing angles are great; it is actually what comes with an IPS screen. Outdoor visibility is also great, although not as bright as indoors when you are directly in the sunlight. The screen is responsive even to the slightest touch, and I didn't find any issues with it. LG Rebel L44VL ships with a 1940mAh battery that's very powerful, given this is a very compact device. It gives you a talk time of 9 hours and a standby time of up to 11 days. The battery can withstand a full working day of typical usage as I discovered. My typical usage includes texting, a few phone calls, checking my emails, listening to music with my earphones and of course peeping through social media once in a while. However, with video streaming, live Google Maps navigation, or consistent usage of data, the battery may not hold for long. You may be looking for a charging outlet in about 5 hours. 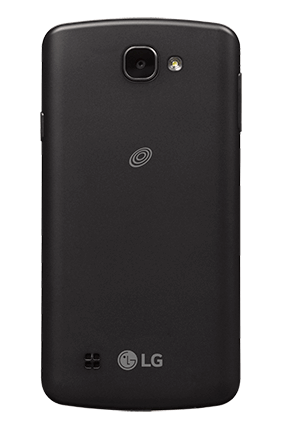 Onboard the LG Rebel L44VL is 8GB of internal storage. 4GB is available for your usage; the operating system uses the other 4GB. The internal storage is about enough if you consider installing apps and having some of your favorite songs. The phone does support an external microSD card with a capacity of up to 32GB. With the external memory card installed, you can have lots of videos and pictures on the phone. The LG Rebel L44VL is fantastic in performance as a result of packing high-end features. First, it comes running Android 5.1 Lollipop which brings a very fluid user interface and access to thousands of apps that the OS supports on Google Play Store. It's powered by a Qualcomm Snapdragon Quad-core Processor running at 1.1Ghz paired with 1GB of RAM. Android Lollipop comes with some very smooth animations and a great user experience. Apart from that, it comes with several apps installed ready to use. All the Google apps are installed, such as Gmail, Hangouts, Play Music, Play Store, Chrome, Google Plus, YouTube, Google Maps. YouTube is one of the favorite apps used by most people. I spent most of my time on it because it really performs great on this device. The video quality is truly HD because the LG Rebel L44VL is quad-core and can handle it. Internet speed is incredible since the LG Rebel L44VL is a 4G LTE enabled device. You don't experience slow page loading or buffering on this device while you are still within your Straight Talk monthly data plan - I will discuss more on the wireless plans later in this review. 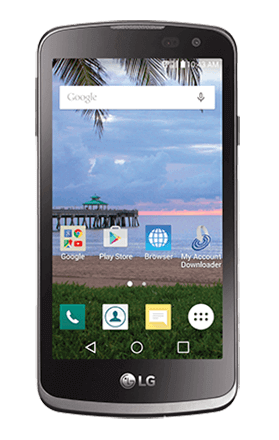 The LG Rebel L44VL has floating navigation buttons which are very responsive. Amongst these buttons, we have the recent apps button that lets you multi-task. It simply means the phone can have several apps open and you quickly switch between them by tapping the recent apps button, and the launch speed of apps is even faster. One other thing that also impressed me is the "double tap on screen to turn on backlight" feature when the phone is in sleep mode. I think this is a cool thing because you don't have to use the power button every time. LG Rebel L44VL has a built-in Artificial Intelligence to understand voice commands. The camera uses this feature to take photos. It can perform a lot more functions with the voice command making the whole LG RebelL44VL experience fun and worthwhile. For instance, there's an app called Voice Search that listens to your commands and carries out functions like send an email, make a phone, set the alarm, and so on, without you having to tap the phone keys. I found this to be an amusing way to use my phone. The phone has a proximity/ambient light sensor that detects how close your phone is from you. It comes in as a power saver, especially when you are receiving or making a call; it detects when you place your phone on your ear and then turns off the backlight and locks the screen. It thus extends the battery life. It has accelerometer sensor that lets you control games by tilting or turning your phone. Other features include Bluetooth 4.1 for quick sharing of files between devices. It has Wi-Fi support. It has GPS for live Google Maps navigation. 5MP Back camera. 2MP front camera. Battery capacity: 1940mAh. Talk time up to 9 hours. Standby up to 11 days. Internal Memory: 8 GB. Supports external microSD card up to 32GB. Dimensions: 5.20'' (Height) x 2.63'' (Width) x 0.35'' (Depth) inches. Sensors: Accelerometer, proximity/ambient light sensor.